What's Swedish for "I remember when you were cool"? Today we made a day trip across the water to southern Sweden, stopping off in the lovely town of Lund. 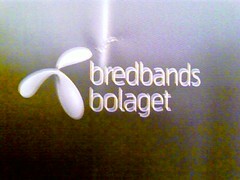 Snapped this along the way, the mighty Bredbands Bolaget, now branded under Telenor's limp, three-winged roomarang. More normal blog service should resume next week, when I'm back in the Big Smoke. Meanwhile, thanks to the ever-impressive Benoit for the kind words (one of my proudest moments was in hounding him into blogging in the first place, and he has never once let me down! ), as well as to Dan York and Alec Saunders. Whoever said nobody loves you when you're down and out was waaaaay off target. I'm with the family in a rented summer house in the forest in North Zealand in Denmark, about an hour north of Copenhagen. While I'm having a mostly self-imposed web hiatus during the holiday, I figured I might as well blog this as I was posting the photos to Flickr. 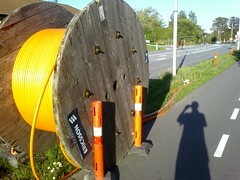 This photo was taken in the village of Vejby (my guess is there are maybe 100 households), where the unfortunately named Dong Energy is apparently in the midst of a fiber roll. I have seen similar scenes in other nearby villages, and am highly impressed, even envious. Podcast, moi? When I was cut down in my subprime and returned to this humble bloglet, I determined that I wanted to do things differently this time around. As a case in point, here's an interview with Thomas Anglero, a friend and passionate entrepreneur, about his new venture, WiHood. 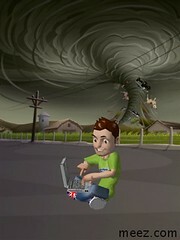 WiHood weds e-learning with SaaS and cloud computing, delivering a unique, portable, virtual desktop aimed at students, and I think it deserves a lot more attention than it is getting so far. Thomas has a lot of interesting things to say about the process of establishing a start-up, cutting through the noise, dealing with VCs and staying motivated. There's obviously a lot more he could have said about the specifics of WiHood, but we wanted to try to keep it light. Hope you enjoy it. Thanks Damien, for "uberbolloxmegashame". I couldn't agree more, but couldn't find the words to articulate it - until now! Eurodata from heaven... A super-prime polyglot Palladium Class mega-uber value reader thankfully responded to my plea for pan-European data on subscriber satisfaction/network performance data, with some interesting input on France and Germany. Germany: An interesting and comprehensive ranking of operators here. I'm intrigued to see cable operators, which have historically suffered from a hugely asymmetrical funding and capex legacy, scoring on a par with, or slightly better than, many of their DSL competitors (on a 1-to-5 ranking). In particular, the results turn up as: Kabel BW (cable) 4.1, ish (cable) 3.6, Primacom (cable) 3.4, Kabel Deustchland (cable) 3.3, Unitymedia (cable) 3.1, iesy (cable) 2.9. In contrast, many of the DSL players rate below 3.0 (i.e., average), including DT's own offerings. Not hugely impressive. I am particularly depressed to see Versatel at a ranking of 2.2, given that many regard this company as the jewel in the crown in any German infrastructure roll-up scenario - the company has unparalleled infrastructure assets in its four major regional markets, but has significant issues on the retail front, an unwelcome challenge for Apax, who are presumably looking for a get-out-of-jail card sooner rather than later. Speaking of which, am I alone in assuming that there must eventually emerge an unholy alliance between the alternative DSL players and the Level 3/4 cable players in Germany to create an alternative to DT's monolithic infrastructure "vision"? Perhaps I'm a conspiracy theorist, but I find it really interesting that Kai-Uwe Ricke, former CEO of DT (whose DNA is very definitely magenta), left the company under pressure (God knows the CEO role at DT is something you would only wish on your worst enemy), and ran straight into the arms of private equity (as an advisor to BC Partners, majority shareholder in Unitymedia, and as an advisor to KabelBW) and also earlier this year joined the advisory board of United Internet, DT's major irritant. Dr. Ricke is nobody's fool, and I'm sure he doesn't hang out with German cable and altnet companies just for the comic value. Something is going to happen here, mark my words. Sam knows, at least in the UK. I assume a number of other countries have similar sites/services, so please send me some links, no matter how insurmountable the language barrier may seem. I'd be particularly interested in seeing some performance comparisons between cable and DSL in the German market, if anyone knows of such data, and also anything from Eastern Europe/Turkey would also be appreciated. Well, my newfound idleness has already resulted in a couple of invitations to speak at conferences, the dates for which I will provide nearer the time. One presentation is to focus on my old flame, FTTH, with an emphasis on real-world issues. So, if you're involved in a real-world FTTH project, or are trying to get one funded, I'd be interested in speaking with you in order to make your experience part of my message. Ping me.